Wow, the UKMET is REALLY south. Yup. At least we've got surprise flurries today. South is fine, but weak is not...need a strong upper level system to get the cooling. NAVGEM would get the job done(great low placement). Just wish it wasn't March. That 540 line is pretty far south. Look good. Robert @WXSouth talked last night about CAD with this storm. Lawrdy Lawrdy at the 18z Nam: W/S and Gboro 9+. Can you share the image? Huh...what---Who woke me? Thought it was Spring. Unless you sleepwalked about 100 miles NW while hibernating it's going to be a cold rain. Some more big model hits at 0z tonight. Can't discern ukie to well yet, Acc tourney. ICON will make alot of folks happy. We should be getting more definitive , cohesive forecast for our backyards by tommorow night. Yep ICON is a beauty!! JMA ? 6Z GFS a whiff for the triangle. Maybe some deformation band flurries. That's it. GFS would be a wicked heavy power outage type snowstorm for VA. I’m up in CT still and was able to witness their nor’easter they got up here and it was awesome. Going to have to monitor this one. 06z RGEM Some might get lucky and have a period of wet snow at the end!! Location:Two Rivers Farms ,Moncure N.C.
12Z NAM will have my attn. Yep. As I said before, we have nothing to lose and maybe a lucky win. It will take a perfect setup (...even more than normal). My worthless 2 cents from the mtn thread. I'm feeling good about the model guidance right now, even though a spread exists. Blacksburg has a decent disco on the event and they aren't buying the gfs solution. Interesting note...they think the strength of the storm modeled by the gfs may be correct though. Now that would certainly be a dumping of snow for our area. Agree. The GFS would have to score a major coup over the higher res Euro,ICON, way better performing UKIE, and Nam. Anything can happen, but the gfs being right verse the above is highly unlikely. Today will be the day of reckoning, definitely by 0z tonight. All the pieces to the puzzle will be well sampled and loaded in. I anticipate that at some point,most likely 0z tonight hopefully right after Duke beats unc, the gfs will fall in line, adjust. NAM did trend higher with QPF up my way, closer in line to GFS. Much weaker albeit with system and south overall however. 12K NAM gives me 7''. 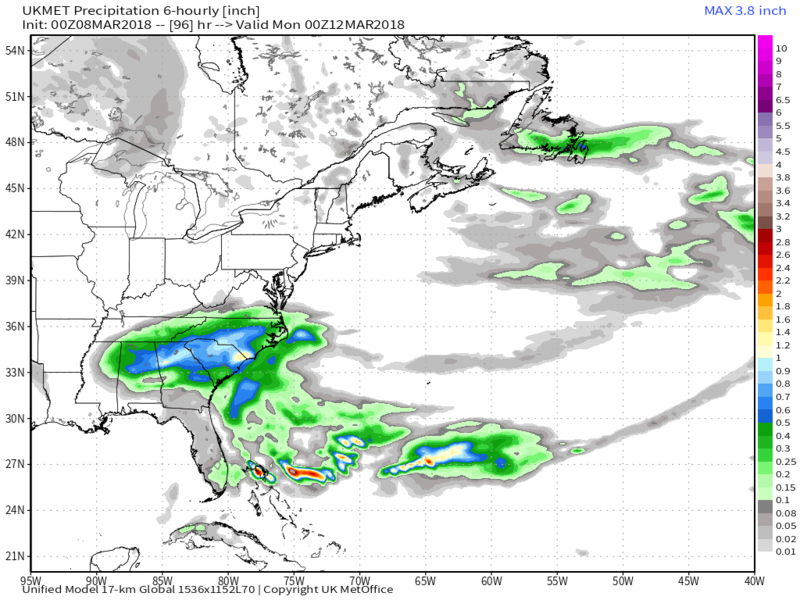 12z RGEM looks ominous and more GFS like with the Miller B setup. Low over central TN at end of its run. 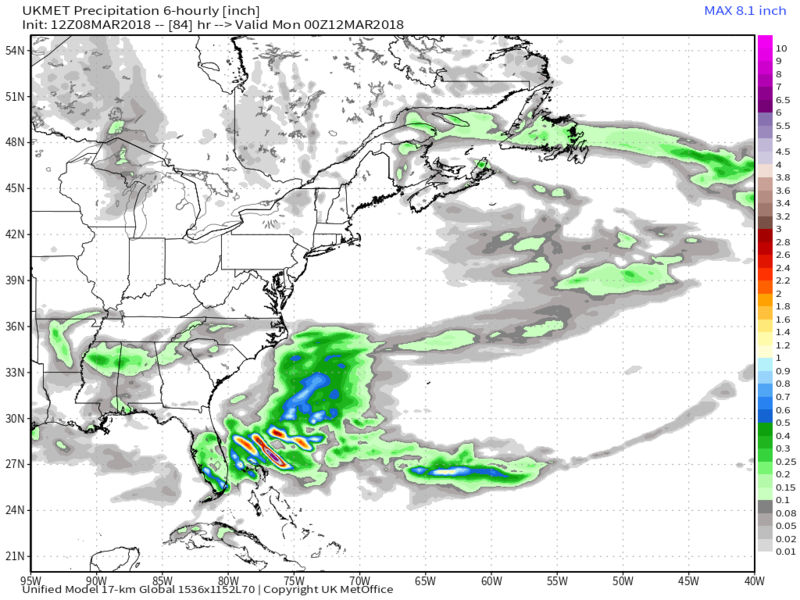 RGEM still just a touch out of its range but I feel like it has performed very well this year. 12z GFS going to be a big hit for VA northern NC mountains. Crazy spread at this timeframe, although Nam imo took a step toward GFS this morning. GFS comes south and tries to come off the island it’s on. 12z GFS moved away a bit from its idea of a stronger lead wave moving through TN. 12z CMC looks similar to GFS. Both look pretty good in your area Buddy. CMC has kind of been between the farther north GFS and weaker, farther south Euro/UKMet camp, and may be a good middle ground. For NC, it looks too warm on the front side of the storm, except for maybe the northern mtns...then there could be some changeover for some areas depending on how the backside wave evolves.